England and Costa Rica lock horns on Thursday's International Friendly night and bookmaker Coral is offering a massive 33/1 for A Goal To Be Scored (over 0.5 goals). This is your best chance to make a profit on this match! Stake £1, get a £33.00 return as soon as a team finds the back of the net! Plus, receive £5 free bet if the match ends in a goalless draw! England are coming fresh off the back of a 2-1 win over Nigeria at Wembley, extending their unbeaten run to 13 matches before to travel to Russia. Are you placing a bet on this match? You can earn £25 if the match doesn't end in a 0-0 draw! 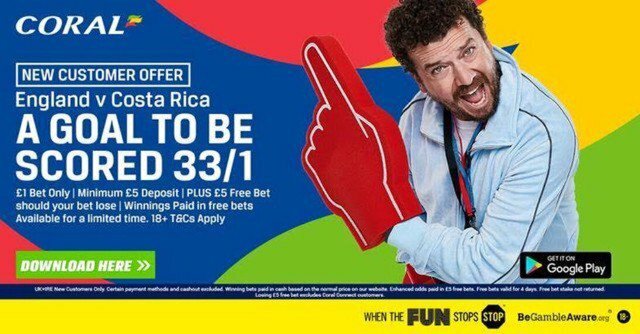 Read this article and learn how to claim your 33/1 price boost for A goal to be scored in England v Costa Rica! Register a new account with Coral before the start of the match (Thursday 9.00 pm, UK Time) and claim 33/1 ANY goal to be scored during England v Costa Rica! You won't find a better promotion today! This bet (Over 0.5 goals) is normally available at 3/50, but you can claim a 33/1 price boost! Coral are upping the ante on England v Costa Rica offering a HUGE 33/1 for A Goal To Be Scored! Click here to go straight to the offer and get your boost in two minutes! Should you lose your qualifying bet, you will receive a £5 free bet as a refund. Deposit methods such as Moneybookers, Paysafe, Neteller and Skrill do not count towards this price boost offer. "Get 33/1 A Goal To Be Scored in England vs Costa Rica with Coral"